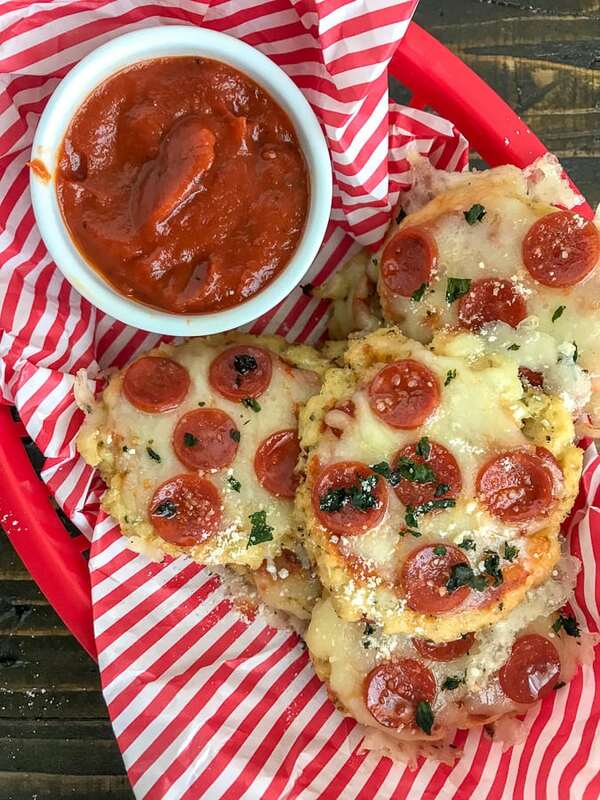 These Mini Cauliflower Pepperoni Pizzas are made with a thin cauliflower crust that is filled with herbs and cheeses. The crust is topped with pizza sauce, mozzarella cheese, and mini pepperoni’s! 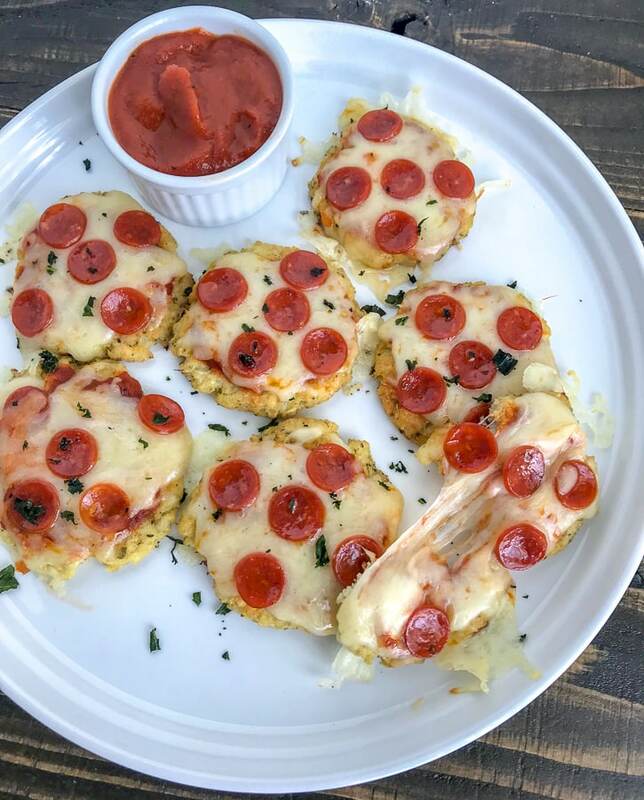 Mini Cauliflower Pepperoni Pizza’s – crazy, right?? There are so many uses for cauliflower and it always amazes me what you can do with it. I have made some remarkable dishes with it. Such as my Creamy Cauliflower Alfredo Sauce recipe. Made with cauliflower as it’s base, incredibly delicious, and one of the most popular/remade recipes from my blog! If you haven’t tried it – give it a go! Make it to have as a dip for bread or try my Grilled Chicken Cauliflower Alfredo with Zucchini Noodles recipe! The first time you experiment with cauliflower as the base to a pizza crust – you may not jump for joy. You may end up wondering why the crust is soft or mushy and not crisping up like it should. 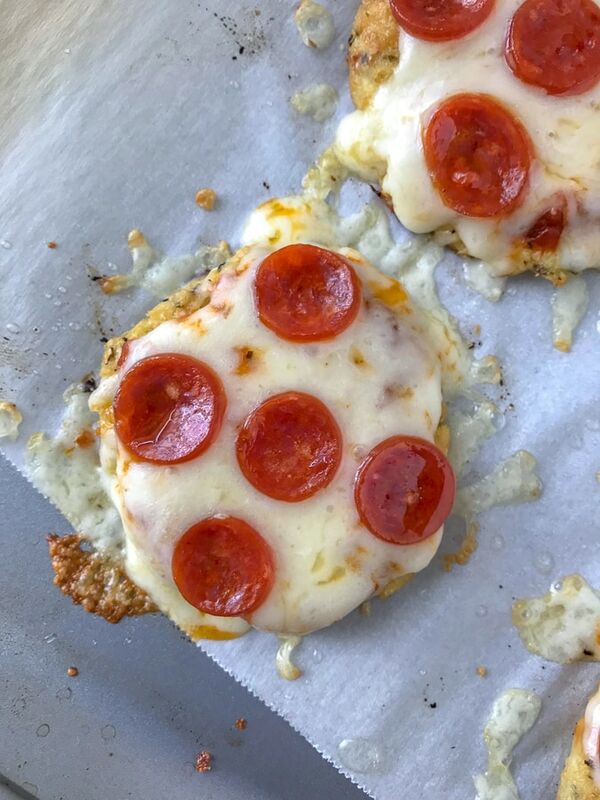 Or you may achieve a crispy cauliflower crust, not care for it, and end up picking the toppings off. It’s a finicky vegetable to manipulate into crust – but definitely doable! Now obviously this isn’t going to taste like bread, but if you’re trying to make a go at eating healthier – it’s worth trying! You just need to know how to flavor it! 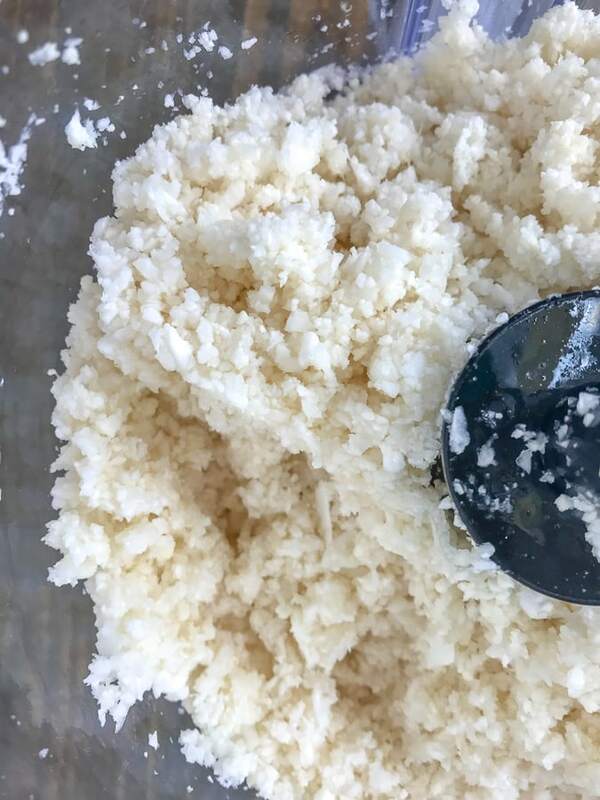 Process a full head of raw cauliflower down into ‘cauliflower rice’ using a food processor. A cheese grater works well, too, but its much easier using a processor. Saves your fingers, too! Do not over-process. Keep your eye on it. Otherwise it will turn to mashed cauliflower. The key to getting a crispy, firm crust – soften the cauliflower rice by warming it in the microwave and once cooled – straining it of any water/moisture. The more water you remove – the better. To strain the cauliflower rice: use a fine mesh strainer and spatula, a thin kitchen towel, or cheese cloth. All methods will work to squeeze the water out. The best, easiest method I have found is using a cheese cloth. They’re inexpensive and can be reused! You can find cheese cloths at any store that sells kitchen items or on Amazon: Unbleached Cotton Cheese Cloth Strain. Place the cooled cauliflower rice into the center of the cheesecloth, pull the ends up and twist to close. Into the sink, squeeze the cauliflower and continue to squeeze until a majority of the water has been removed. From there, combine the strained cauliflower with the remaining ingredients. Once the crust has been mixed thoroughly, spread the mixture into 12 flat mini pizza’s or even 2 small pizza’s. I used a tablespoon to scoop out two tablespoons of the mixture into the palm of my hand. From there I lightly, but firmly, rolled the mixture together in my hands to create a ball before placing it onto a prepared baking sheet. Use your fingers or the back of a spoon to smooth out into a thin layer. 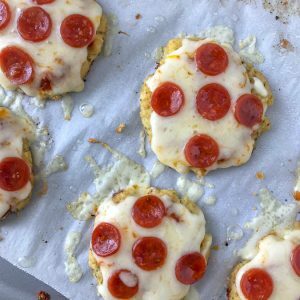 If making mini pizza’s, this recipe will make 12 bite-sized pizza’s or two small pizza’s. Be sure to spread the crust thin so that it will crisp up while baking. The best part of this recipe is that you can make it however you want once you have the base crust mixture. 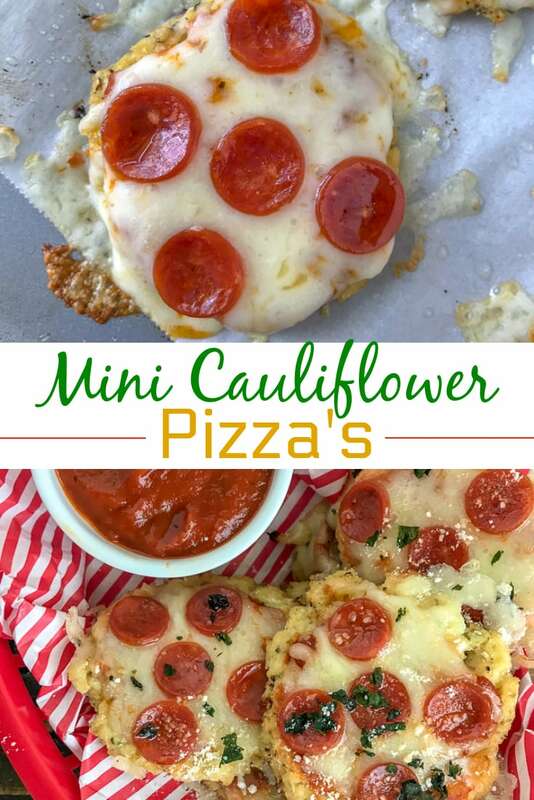 Make 12 Mini Cauliflower Pepperoni Pizza’s or 2 small pizza’s. Swap out the mozzarella cheese topping for the cheese of your choice; provolone, cheddar, blue cheese, etc. If you want a lower calorie option, swap the pepperoni for sliced tomato or sautéed vegetables. Swap the pizza sauce for your favorite one: pesto, bbq, alfredo, etc. The options are endless! Don’t be afraid to get creative! 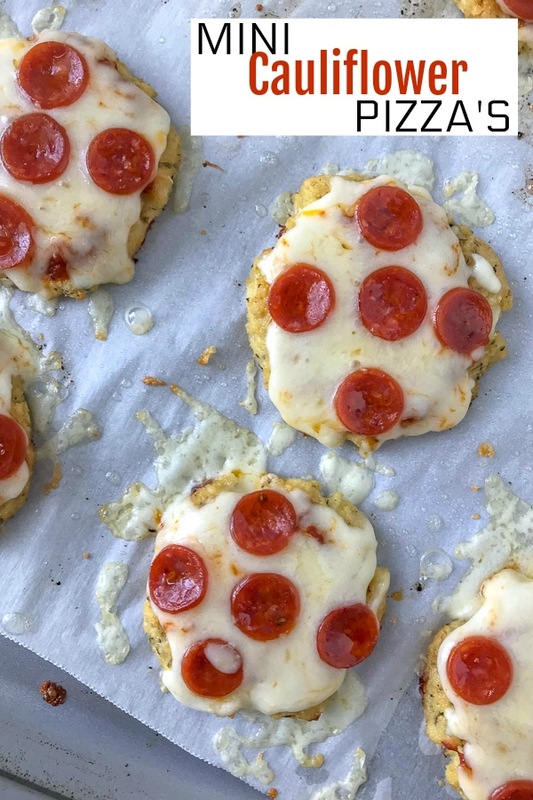 These Mini Cauliflower Pepperoni Pizza's are easy to make, kid-friendly, and sure to be a crowd pleaser! 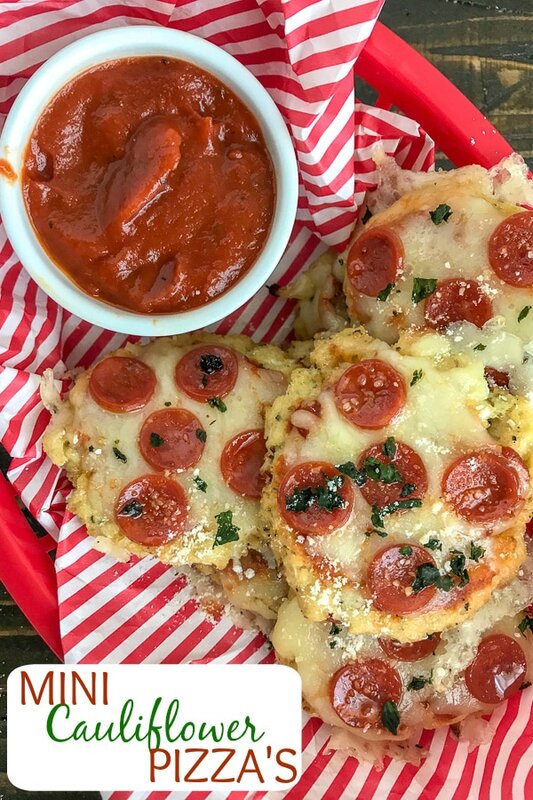 Crispy cauliflower crust topped with pizza sauce, mozzarella cheese, and mini pepperonis. Preheat oven to 425 degrees F. Line a baking sheet with parchment paper; set aside. Place the cauliflower florets into the bowl of a food processor and pulse until it reaches a rice-like consistency. A large head of cauliflower should yield approximately 3 cups of 'cauliflower rice'. Transfer cauliflower to a microwave-safe bowl. Cover with a paper towel and microwave for 5 minutes; set aside to cool. Once the cauliflower has cooled, transfer it to the center of a thin dish towel or cheese cloth. Pull the ends up and twist to close. Squeeze the towel/cloth tightly and several times to remove as much water as you can. Combine the cauliflower into a large bowl with remaining crust ingredients listed. Using a measuring tablespoon, scoop two tablespoons of the crust mixture into the palm of your hand. Roll firmly into a ball and place onto the prepared baking sheet. Using the back of the tablespoon or a large soup spoon, smooth each ball down into thin circles. The thinner the better! Spray each lightly with nonstick cooking spray and place into the oven to bake for 12-13 minutes. Or until golden in color and firm. 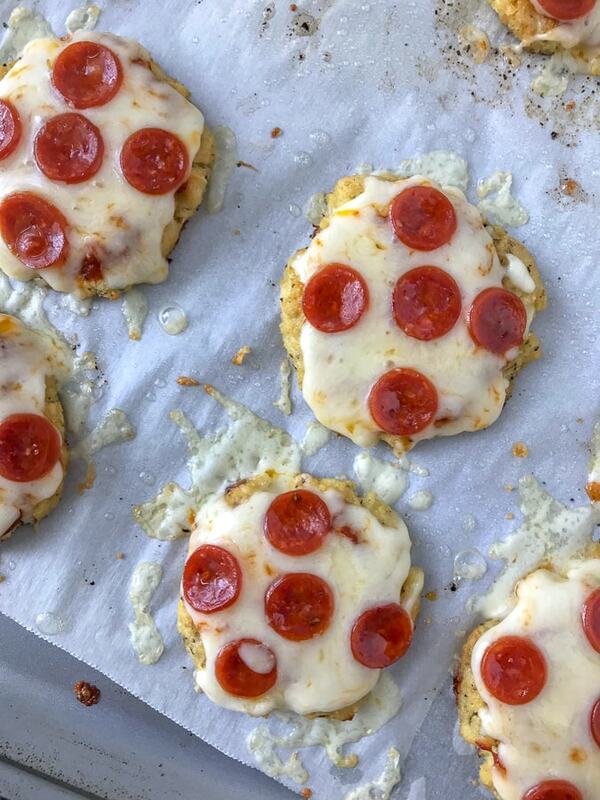 To each pizza add 1 teaspoon of pizza sauce, mozzarella cheese, and 5 mini pepperoni's. Place back into the oven to bake for 3-4 minutes or until the cheese has melted. Best served immediately. Garnish with basil and parmesan cheese. Dip in extra pizza sauce. If you find that the crust is not crisping up after 10-12 minutes, try flipping the pizza's over to cook the other side.